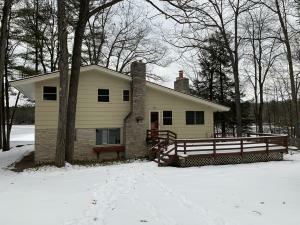 WONDERFUL WATERSPORTSYour family will love living lakeside at this 4 bedroom, 2.5-bath multi-level home located on beautiful Heart Lake in Gaylord. Main floor consists of open kitchen, dining room, and large living room with wood-burning fireplace and lake views; upstairs includes master bedroom with double closets and full bath, two additional bedrooms and half bath; lower level has family room with doorwall going out to lake and another master suite with gas fireplace; and the lowest level has a den/playroom with another gas fireplace and mechanical/laundry room. Space for many in this great house - and great potential as a vacation rental. Natural gas forced air heat, cable internet, detached 2+ car garage, shed, plus spacious deck and large fenced in area great for littles and pets.